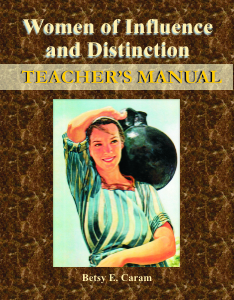 This teacher manual is based on Betsy Caram’s book Women of Influence and Distinction. In this book the author shows it is very evident from Scripture that women are, and always have been, very much involved in the plan and purposes of God in the earth. Women have been the instruments of God in the past, and He still uses them today to accomplish His ministry to a lost and dying world. This book will examine the lives of many of the women found in Scripture, considering the special characteristics which caused them to be recorded in the Bible’s sacred pages.